An archaeological team from the University of Buckingham’s Humanities Research Institute has been uncovering very large amounts of Mesolithic material from a site immediately adjacent to Stonehenge. At a point called Blick Mead (a part of the Stonehenge landscape known as ‘Vespasian’s Camp’ on the mistaken assumption that it was the remains of a former Roman settlement) around 12,000 pieces of worked flint and burnt flint have been unearthed, as well as over 500 pieces of bone dating from over 8000 years ago. Virtually all the tools are in pristine condition – indeed, some of the team have had their fingers cut by them as they are still so sharp. The most significant consequence of the excavation is that we have now discovered where the communities who built the first monuments at Stonehenge once lived – something that has eluded archaeologists for the best part of two centuries. But the fact that the site also provides evidence for ritual activity in later periods suggests that the Buckingham team has also discovered a rare ‘multi-phase’ site, which was occupied over several millennia – indeed into the early medieval period. 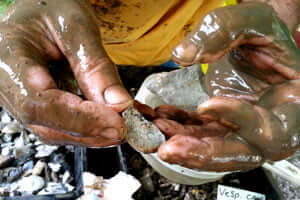 David Jacques, Senior Research Fellow in Archaeology at the University of Buckingham’s Humanities Research Institute, has been directing the excavations at Vespasian’s Camp, Amesbury, Wiltshire, since 2005. The archaeological potential of Vespasian’s Camp first came to light as a result of David Jacques’ detailed research of the site’s estate and nearby farm records. Indeed, before his team started their excavations, there was no evidence of Vespasian’s Camp having played any significant part in the Salisbury Plain ritual landscape or its history, and the site had been generally ignored by archaeologists, who assumed that any archaeological evidence on the site had been destroyed in the course of the landscaping of the area as a park for a neighbouring country house during the course of the 18th century. Radiocarbon dating of objects from the Buckingham-sponsored excavations now shows that this site was occupied between 7550-4700 BC, which means that the Blick Mead site was in continuous use for almost 3,000 years. 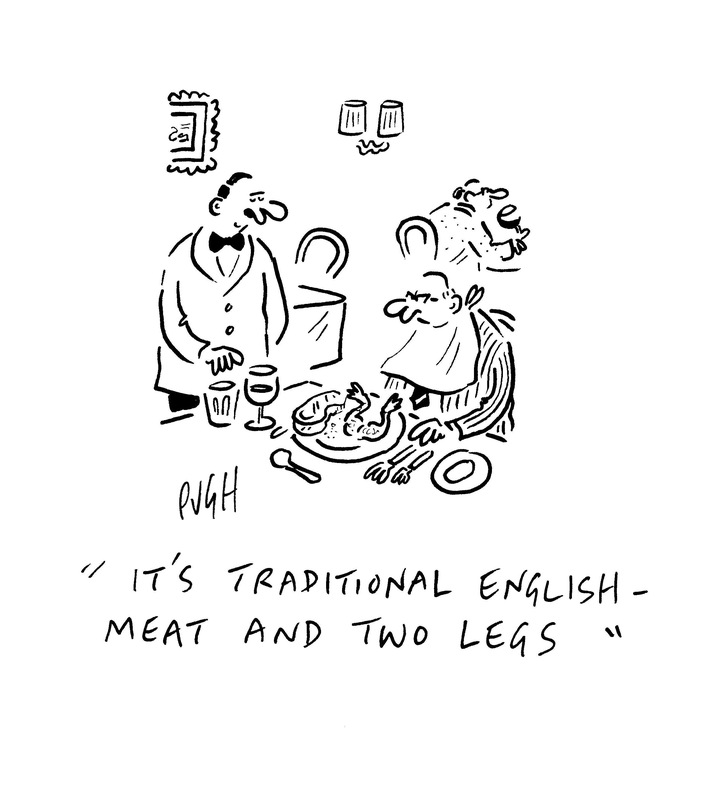 This is generating great interest from archaeologists who have long pondered the possibility of a ‘missing link’ between the Mesolithic and Neolithic periods of activity at Stonehenge. The radiocarbon dates make this the oldest ever ‘homebase’ found in the Stonehenge area and could be one of the reasons why Stonehenge is sited where it is. The findings produced by the Buckingham-funded excavations have led English Heritage to describe Vespasian’s Camp as potentially ‘one of the pivotal places in the history of the Stonehenge landscape’. A copper alloy Bronze Age dagger, found nearby, at the Bluestonehenge monument in 2009, a 5th-century Anglo-Saxon disc brooch from a nearby spring, and medieval wooden staves from the main spring also connect Blick Mead to the early Anglo-Saxon and Amesbury Abbey periods. 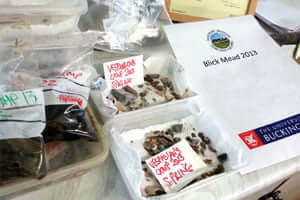 They add to the picture of the Blick Mead area being a place associated with veneration over the longue durée. As a result of the support from the University of Buckingham’s Humanities Research Institute, further work is planned over the next two years. The Henge on a Hill off Longhollow Road: It’s a Mystery! Happy October and welcome! When we last left the state of Illinois (almost five years ago! ), it was boasting a single, rather idiosyncratic Stonehenge replica not far outside Chicago at a paragliding and flight field. That one has since gone to new owners and for all we know may no longer be there. As can be seen, the Eastern portion of the A344 has been consigned to history, fulfilling the wishes of generations of visitors. As a result the map has been amended and now looks a lot less of a national disgrace. In fact, the map is already out of date because the remaining portion of the road should be shown as “restricted” for as from last week …. Golden treasures from prehistoric Britain’s Stonehenge era, most of which have never previously been on public display, are today being unveiled at a small provincial museum. The exhibition is the largest collection of early Bronze-Age gold ever put on public display in England. It was impossible to exhibit most of the gold treasures before because of security concerns. Up until now the closest the public got to them was by seeing photographs. Housed in a new, high-security and humidity-controlled series of galleries inside the Wiltshire Museum in Devizes, 15 miles north of Stonehenge, the gold treasures and other objects are being used to reveal the remarkable cultural story behind the world famous prehistoric stone monument. The new Stonehenge-era galleries will feature at least 500 Neolithic and Bronze-Age objects from Wiltshire, many of them from the once sacred landscape around the monument itself, including a beautifully decorated golden cloak fastener, a magnificent bronze dagger with a gold-covered hilt, a gold decoration from a dagger sheath, the golden tip of a ceremonial sceptre and gold necklaces, earrings and pendants – as well as other high- status precious objects made of jet, amber and stone. “These and other spectacular treasures from the age of Stonehenge were unearthed by antiquarians and archaeologists in the late 18th and early 19th centuries, but until now it’s never been possible to give the public permanent access to them,” said the museum’s director, David Dawson. “Stonehenge is an iconic monument – but this is the first time that such a wide range of high-status objects from the spectacular burials of the people who used it, has ever been put on permanent display”. They will tell the story of the people who lived in and around the Stonehenge landscape when the monument was one of the great religious centres of Western Europe. 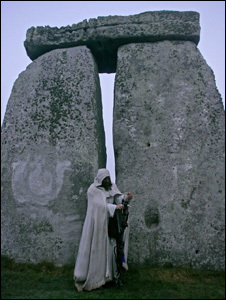 “Many of the items may well have been worn by Bronze-Age priests and chieftains as they worshipped inside Stonehenge,” said Mr Dawson. Axes and daggers on display in the new purpose-built galleries are identical to images of weapons carved into the giant stones of Stonehenge itself. “We believe the new displays are a major step forward in helping to explain the extraordinary sophistication of the remarkable people who used the world’s most famous prehistoric monument,” said Mr Dawson. 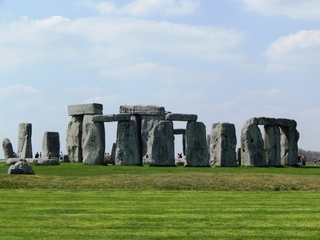 Over the past few years, an unprecedented amount of new research has been carried out on Stonehenge and its ancient culture – and the new galleries reflect that new knowledge, especially an increased understanding of how the different prehistoric artefacts were made and what they were originally used for. Around 30 gold objects, made by craftsman between the 2200 and 1800BC, will be on permanent display along with hundreds of other Stonehenge-era treasures. The creation of the new high-security Stonehenge-period galleries puts Devizes’ Wiltshire Museum into a totally different league in terms of exhibits and their interpretation. The new galleries have cost £750,000 to build – with funding coming from, among others, the Heritage Lottery Fund, English Heritage and Wiltshire Council. Devizes has its magnificent collection because it is the home of one of Britain’s oldest local archaeology organisations – the Wiltshire Archaeological and Natural History Society which has been collecting Wiltshire archaeological material since its foundation 160 years ago. Over that period it has conducted more than 50 excavations which have provided the museum with more than 50,000 archaeological finds. 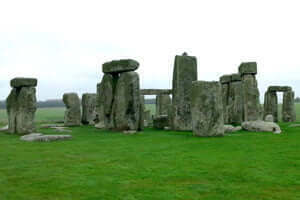 The town itself is located between prehistoric Britain’s two top monuments – Stonehenge and the Avebury stone circles. The launch of the new permanent display at the town is part of a wider display of Stonehenge-era archaeology. On 18 December, just one and half miles from Stonehenge itself, English Heritage will open its new Stonehenge visitor centre, complete with around 300 Stonehenge-period exhibits – while, next spring, Salisbury Museum will unveil newly redesigned archaeological galleries including material of a similar age. including material of a similar age. Crown jewels of Stonehenge go on dazzling display: new prehistory galleries opening 14th October! In September 1808, William Cunnington, who was Britain’s first professional archaeologist, wrote to his patron to tell him that he had discovered what were to become known as the crown jewels of the “King of Stonehenge”. On Monday, some of the treasures he found will go on permanent public display for the first time. Gold from the time of Stonehenge: new prehistory galleries at the Wiltshire Museum in Devizes Opening on 14 October, a completely new display over 4 galleries will tell the story of the Stonehenge and Avebury World Heritage Site. On display for the first time are dozens of gold items dating to the time of Stonehenge. Many were found Bronze Age burial mounds within sight of Stonehenge, and were worn by people who worshipped inside the stone circle. These nationally important objects have never been on permanent display, and are now on show as part of this £750,000 gallery development at the Wiltshire Museum – home of Britain’s richest Bronze Age collection. The centrepiece of the stunning new displays is Britain’s most important Bronze Age burial. The Bush Barrow chieftain lived almost 4,000 years ago and was buried in a barrow overlooking Stonehenge wearing the objects that showed his power and authority – including a gold lozenge, a ceremonial mace and a gold-decorated dagger. Axes and daggers like those found in the grave are carved onto the Sarsen stones at Stonehenge. 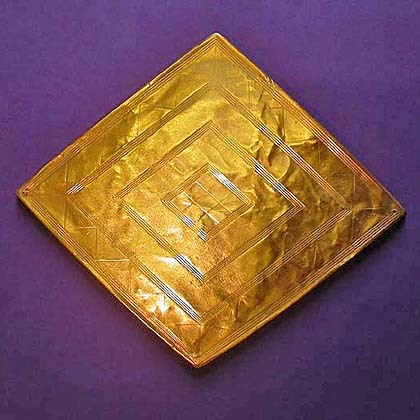 The precision and design of the Bush Barrow lozenge proves that the people who built and used Stonehenge had a detailed knowledge of mathematics and geometry. 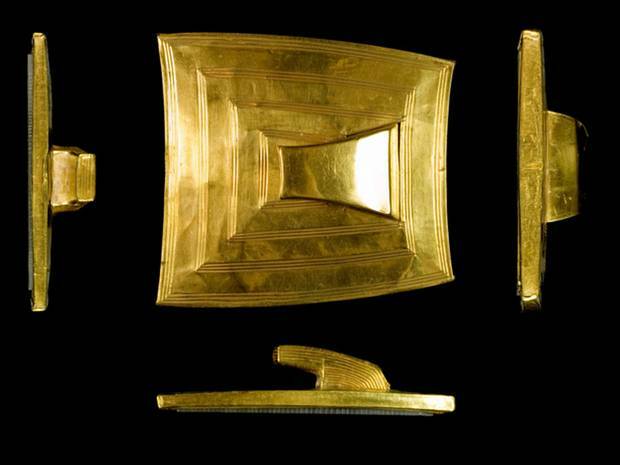 The gold finds from Bush Barrow have never before been on permanent display in Wiltshire. The image alongside show Sebastian Foxley of the Wiltshire Council Conservation Service and David Dawson, Director, moving the Stonehenge Urn to its new home. 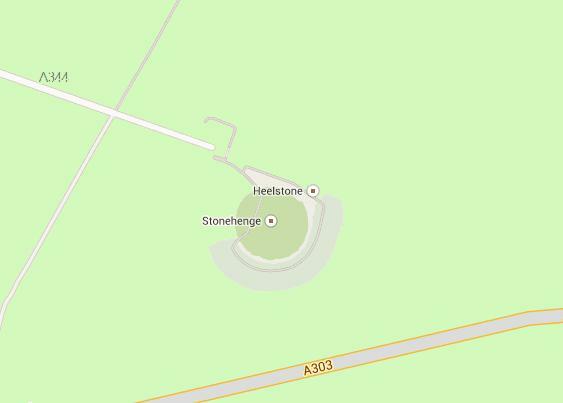 There’s a chance for us to have a say on the way Stonehenge is looked after at a series of meetings around South Wiltshire this month. English Heritage are taking their World Heritage Site Management Plan on a roadshow, so as many local people as possible can see it. It’s thought there are many major changes in the document, but the plan has to be renewed this year.